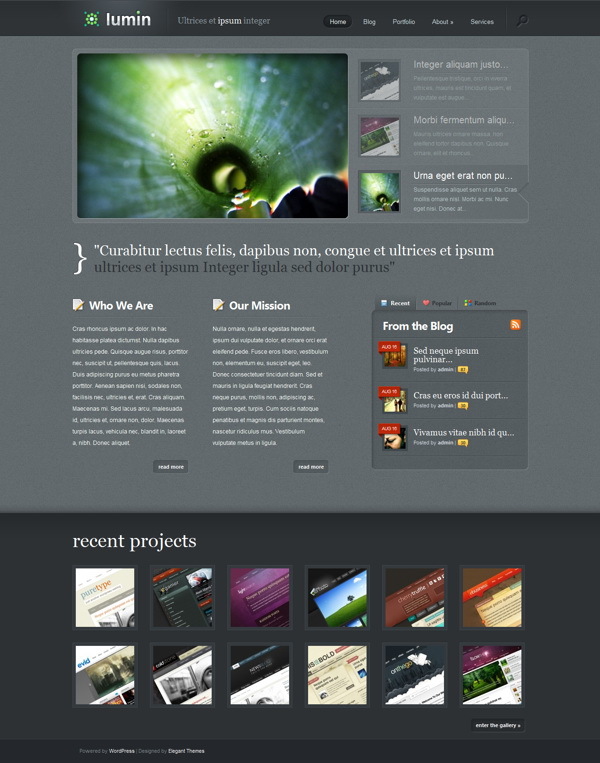 Lumin is a sleek and professional portfolio theme built in a CMS style. This allows you to have a page-based layout, while still maintaining separate post-driven Blog and Gallery sections. The Blog and Gallery sections have been customized with unique post styles that deliver content in a more functional manner. Lumin comes with three different skins, and each skin with three different color schemes. For more info refer to the slider and preview links above. Lumin allows you to create a separate galery section on your site, great for a portfolio or image display. Even though Lumin was created to be a CMS with a Page-Based structure, you can also run the theme like a normal blog instead. This theme utilizes timthumb to automatically resize your thumbnail images. Because of this, only one thumbnail images is required per post, despite the various thumbnail sizes used in the theme.